Santa Ana Lane blew his rivals out of the water to land his fourth group 1 in the VRC Sprint Classic. Anthony Freedman has two runners, Shoals and Santa Ana Lane, in The Everest and is enjoying sharing it with his son Sam. The six-year-old triple group 1 winner flew along the rails to take Saturday’s group 2 Premiere Stakes, smashing the 1200m Randwick track record. Anthony Freedman has seen plenty in the racing game, but the hype towards The Everest, in which he will start Santa Ana Lane and Shoals, has stunned him. 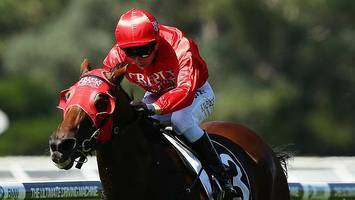 Anthony Freedman has opted to send the triple Group One winning mare to Sydney on September 29 over the Moir Stakes at Moonee Valley. Anthony Freedman will boast multiple runners in this year's The Everest after slot-holder Inglis snapped up Santa Ana Lane for the $13 million sprint. Santa Ana Lane has risen from the Wagga Town Plate to the Stradbroke, and his trainer believes he can go even higher. Ben Melham has landed his third Goodwood aboard Anthony Freedman's Santa Ana Lane. It was back to the future at Caulfield on Sunday when Anthony Freedman sent out the quinella in the group 1 Sir Rupert Clarke Stakes, one of the most competitive handicaps of the season, with outsider..
TAKEDOWN and Santa Ana Lane might dominate the market for tomorrow’s Group 3 Gold Coast Guineas (1200m) but the Snowden stable reckon they can pull off an upset with Brigadoon Rise.